Before I start my morning on the fake bike, have tea and then apply myself to the last stitchy licks on Elvis’ lips I wanted to check in. Research for creation of any Soft Boy doll begins with pleasurable perusal of pictures, sounds, film and video. Netflix is stingy with the Elvis films they have up for streaming. There is only one — Follow that Dream. Still, it did provide a nice refresher on his lovely lips. Filmed in 1962, the young Elvis looked so miserable in his task, so uncomfortable at being in such a stinker, that it really incited my empathy. 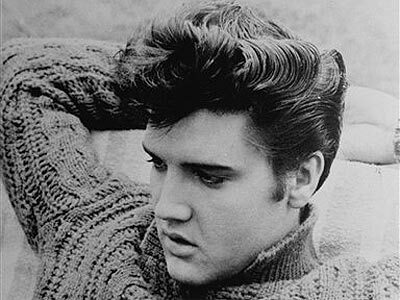 I was never an Elvis fan through girlie attraction but always dug Elvis as a strange-but-true American phenom. His mighty image still rattles through millions of minds. Immoral, half-wit, sell-out doctors enabled poor E to pursue such a sloppy end. Boo. This entry was posted on April 21, 2011 at 7:04 pm and is filed under constructions, dolls, film with tags Elvis, Follow That Dream, Lips. You can follow any responses to this entry through the RSS 2.0 feed. You can leave a response, or trackback from your own site.